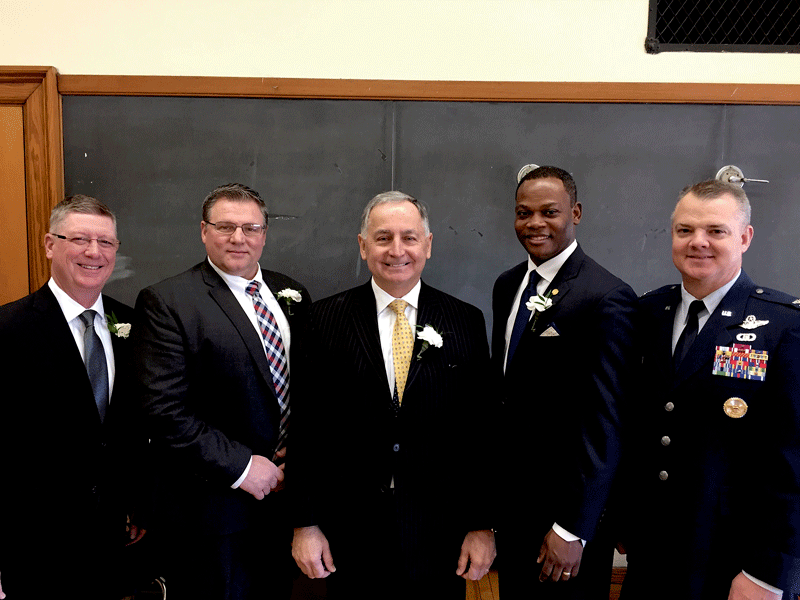 At last week’s inauguration of Chicopee officials, Mayor Richard Kos (center) is flanked by, from left, state Rep. Joseph Wagner, City Council President John Vieu, Elms College President Harry Dumay, and D. Scott Durham, Airlift Wing commander at Westover Air Reserve Base. Mayor Richard Kos is fond of pointing out that Chicopee is alone among Western Mass. communities in having two exits off the Mass Pike — and now it has a third ‘beacon’ of sorts, as he calls it, with the new Mercedes-Benz dealership lighting the night as it overlooks the Pike at exit 6. In that vein, the mayor is gratified by a number of businesses choosing to locate or expand in Chicopee, as well as a raft of municipal projects and public-private partnerships that continue to raise the quality of life in this multi-faceted community of more than 55,000 people. That would be Tru by Hilton, another major project, this one bordering the Mass Pike at exit 5. The owners of a Days Inn demolished the outdated hotel on Memorial Drive to make way for the new structure, and the property will include a fast-foot restaurant, a gas station, a coffee shop, and a sit-down restaurant. Other success stories involve long-time businesses like Callaway Golf, which sits on the Meadow Street property synonymous with Spalding for many decades. One key, he went on, whether dealing with new businesses or existing ones that want to expand and invest, is streamlining the permitting process. At the same time, money is an investment — at least, that’s the way municipal leaders see it as they continue to raise the profile of Chicopee’s downtown. Those investments range from a $2.6 million MassWorks grant to improve water and sewer infrastructure to Mount Holyoke Development’s housing project at Lyman Mills, set to open this spring with 110 market-rate units — specifically, loft-style work/live spaces designed to appeal to young entrepreneurs. Kos hopes that development and others like it — such as Valley Opportunity Council’s renovation of the former Kendall House into 41 affordable studio apartments — spur further restaurant, bar, and retail development and create a more walkable, active downtown. Community events, such as the city’s holiday tree lighting, Halloween spectacular, and the late-summer Downtown Get Down, just add to that effort. “We want foot traffic and to get more people down there, which is why we’re investing time and effort to get people to live down there, and make it safer, too,” he added, noting that the City Council recently approved $300,000 to add more cameras downtown and throughout the city to fight and, more importantly, deter crime. Meanwhile, at the former Facemate site, David Spada from Lawrence is building a $21 million, 92-room assisted-living facility on a West Main Street parcel across from the Chicopee Falls Post Office, situated off a new road which leads to the RiverMills Senior Center. Ground will be broken this spring. Other innovative reuse of property includes a three-megawatt solar farm on a 26-acre site off of Outer Drive and Goodwin Street, near Westover Air Reserve Base. In 2016, the city razed 100 units of military housing units on the site, which had sat unused for two decades and become problematic. Once a solar farm was approved by neighbors and city leaders, Chicopee was awarded a $1 million MassDevelopment grant to remediate the property, and with money came from the state’s grant program to support the Clean Energy Assessment & Strategic Plan for Massachusetts Military Installations, the housing was finally torn down. Finally, a lease agreement was signed with Chicopee Solar LLC, a subsidiary of ConEdison Development, to build a solar farm. The city’s investment will be recouped in 10 years through tax revenue and income from the lease agreement, and the government will also benefit because Westover will receive a 5% discount each year on electricity, amounting to $100,000 in annual savings. Other recent quality-of-life developments in the city include a $225,000 investment in Sarah Jane Park, a grant to the Valley Opportunity Council to support a culinary-arts program and expand nutrition programs in Willimansett, and grants to Porchlight, the Boys & Girls Club, and Head Start to improve infrastructure and programming. For the latter, the city helped leverage more than $600,000 in building improvements to the former Chicopee Falls branch library so Head Start can expand programs for hundreds of children in that neighborhood. Meanwhile, the city’s public-safety complex recently saw $9 million in improvements, including a new training facility, central dispatch, and locker rooms. “Both chiefs agree that facility will last multiple generations in terms of the improvements made there,” Kos said, adding that other additions include a new ladder truck and an expansion of the police K9 program. Not all these developments have the splash of a well-lit Mercedes-Benz dealership making a dramatic impression on Mass Pike motorists, but they are all beacons in their own way, testifying to a city on the move, and also a community with plenty of hometown pride.